Chateau Elan Winery and Resort is a premiere popular destination for many Georgians and those who live in the surrounding areas. For decades they have produced some of the finest wine on the east coast and as they continue to expand, they have added a exciting new venture to the mix that local residents will absolutely enjoy. I had the pleasure of attending their Harvest Dinner a few months ago where I first learned that the famed winery was planning to launch a wine box subscription for wine lovers who want to have the Chateau Elan experience in the comfort of their own home and it is officially here. 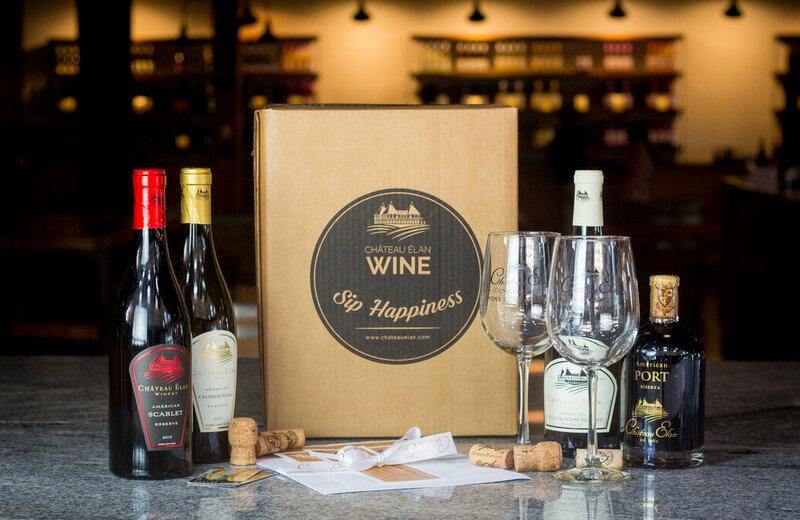 Curated by their in house executive winemaker Simone Bergese, the wine box will feature four hand-selected wines for the season and customers will have the option to choose between the classic, sweet and premium box. “We couldn’t be more excited to launch this offering for our community,” said Simone Bergese, executive winemaker at Château Élan Winery & Resort. “People come to Château Élan and make memories they want to relive. Now, they have the opportunity to do that through a complete sensory experience in the comfort of their own home. We’ve hand-crafted every last detail to ensure this product is one wine lovers in our area can enjoy,” Simone said in a statement. I am a sweet wine gal myself and so I had the pleasure of indulging in the sweet box that included their Duncan Creek, Summer Wine, Dolce Rosso and Moscato D’Asti D.O.C.G. Along with the wine, customers will also receive chef recommendations of food pairings, recipes, and take home gifts such as engraved wine glasses, a wine glass lanyard, buy-one-get-one wine tasting vouchers and much more. If you opt for the classic or premium box, you will also get exclusive discount and tickets to the Quarterly Wine Reception. Because it’s a pick-up only subscription box, it is only available to those who live within 50 miles of the winery. The prices range from $59-$149 per box and with my exclusive discount code LONDON10, you will receive 10% your first box. With the holidays coming up, the wine box makes an excellent gift as well as a great option to have at your holiday soirees.